Today we have to give you the saddest news ever. Chuck lost the fight for his life on December 13 2001 at 4 PM EST. We are all in shock and despite any expectations we had, we can't believe that this is really happening. A farewell word has been posted on the memorial page. Needless to say, we will continue with EmptyWords to honor Chuck's memory, and the memory of the wonderful music he shared with us all. Added an interview with Chuck, mid '95, and a Symbolic review, both from Heavy Oder Was, check the TALKS* and VIEWS* (thanks Aitor). Those of you reading these pages who still have stuff laying around somewhere, please send it over, so we can put it on the site. Interviews, CD reviews, concert reviews, anything worthwhile. Added an article from this month's Rock Hard about the history of death metal, and a Live in L.A. LP review, also from Rock Hard, check the TALKS* and VIEWS*. I want to tell you that Chuck has been very ill for three weeks in the hospital with pneumonia, but is now on the road to recovery and will hopefully be home soon. While it was unexpected, when a person is undergoing chemotherapy, a low immune system keeps that person vulnerable to other illnesses. That is why I have not answered Chuck's email for some time, I am there with him. I will keep Yvonne posted with how he is doing. Added two reviews and an interview (with Chuck) from Metal-Rules (thanks Evil G), check the VIEWS* and TALKS*. Added two interviews with Chuck one from Ill Literature and the other from Sentinel Steel. Also added an interview with Cynic from Thrash 'n Burn (thanks Perry), plus an interview with Gene Hoglan from Rock Hard. Check the TALKS*. And finally we've added the first review of Live in Eindhoven (from Aardschok) check the VIEWS*. Note: These are the first five articles done with the new lay-out. I want to thank everybody for your much appreciated words of support from all over the world, it has been immensely welcomed. I also want you to know that I'm finally making good progress on the road to recovery. I was able to begin the new treatment of chemo that has really made the difference, and for that I thank Chuck Billy and his wife for their great generosity in sharing the benefits from the concert and the fans and friends who were there to make it all possible. I am looking forward to seeing you in the not too distant future. And remember, support music, not rumors!!!! We would like to announce the second wave of eBay auctions that is posted today and can be accessed through Ebay. Future items up for bidding include guitars donated by Andy LaRocque and Novembers Doom, drum sticks and a snare drum donated by Control Denied's Richard Christy, autographed memorabilia from Ozzy Ozbourne, an autographed cymbal from Bill Ward, the original Cannibal Corpse banner used at their live shows (Barnes era) and much much more! New items will be added every 3 days to stagger the work, it's impossible to keep everybody updated through email so keep checking back on the page to see what's new. Thanks go out to everyone that has donated items and helped us to keep this effort going. We have raised about $7,500 so far and although that may not put a HUGE dent in The Schuldiner's financial burden, it HAS helped and it HAS made many things possible for Chuck during his recovery. On behalf of the Schuldiner family, we sincerely thank you. Martyr Music Group acquires Hammerheart America. On October 1st, an agreement was made between Martyr Music Group (USA) and Hammerheart Records (Netherlands) to merge Hammerheart America into MMG completely. The two companies have existed separately, yet side by side, since Martyr Music Group owner, Maria Abril, opened Hammerheart America in the summer of 2000. Commenting on the merger Abril said, "While it was easy enough to run two labels separately from one location, it started to become apparent to both myself and the owners of Hammerheart in Holland that there was a better path for us to take while still ensuring the proper coverage for our artists throughout North America. This way there is less red tape and Martyr Music will continue to grow the way I had planned in 2002. Now artists like Sinister, Dismember and Control Denied will be licensed directly to Martyr Music Group, instead of simply utilizing it's distribution. That, to me, is a very special honor and when I look back on the 3.5 years of history already behind MMG, I can hardly believe this is all real." "We are very happy to see our artists being licensed to Martyr Music Group, so we know they will get the attention and treatment they deserve. The future for Hammerheart Records looks great, and the contribution from Martyr's side only makes it better...we wish Maria and her Headbanger-staff all the success for 2002!" (Guido Heijnens - Hammerheart). "The people at Hammerheart are all really great people. They're honest and they've always treated my staff and I with the utmost respect. I am extremely positive over the idea of continuing on with them and watching something that I gave birth to over three years ago, thrive and make a serious dent in the industry." (Maria Abril - Martyr Music Group). Contrary to what is to being said elsewhere, Tim Aymar is still very much a part of Control Denied. Of course due to Chuck's current condition, the album "When Machine and Man Collide" has been postponed indefinitely. Chuck has already finished recording much of the guitar, and the drum tracks have been recorded, but the album is by no means complete. We added some reviews about Live in L.A. as well as an old review of Spiritual Healing, check the VIEWS. Luca Minieri made great navigation menu's (top and bottom) for the EmptyWords mainpages. Hope you all like it. Thank you so much Luca, we would never have been able to do that ourselves. Live in Eindhoven tracklist: The Philosopher, Trapped In A Corner, Crystal Mountain, Suicide Machine, Together As One, Zero Tolerance, Lack Of Comprehension, Flesh And The Power It Holds, Flattening Of Emotions, Spirit Crusher and Pull The Plug. Added the Rock Hard Live in L.A. CD and DVD reviews, check the VIEWS. Added a report of the Thrash Of The Titans festival, also from Rock Hard, check the GIGS. For everybody who's still looking for merchandise, check www.headbangersdelight.com they still have some stuff, such as the Death logo necklage, in stock. Added the first Live in L.A. reviews from Aardschok (the Rock Hard reviews will follow a.s.a.p. ), check the VIEWS. Also added an old gig review from Thrash 'n Burn, check the GIGS. Added another old article from Thrash 'n Burn (check the TALKS), and the Inhuman Tour Of The World 1991 tourschedule (check the TOURS). Thanks again Perry. I want to thank everyone for your support of the Chuck Schuldiner Benefit Show slated for this Sunday at Packees in Woodbridge, NJ. After a lot of discussion between the bands, myself, the club owner and others involved, we have decided to postpone the show out of respect for the victims of the tragedies on 9/11. We also have concerns that there still may be more disasters to come, though we hope beyond hope that we are wrong. There is just no way you can be prepared for an event like this and no one knows what is going to happen over the next few days. For the safety of everyone involved we think it is best to put the show off for now. Please mention spread the word. We will announce a new date once the show has been re-scheduled. I hope you and all of your friends and family are okay in light of yesterday's tragedies. Added an old interview with Chuck of mid '87 from Metal Forces (the oldest interview up till now, thanks Perry). Check the TALKS. Many of you will recall that when we started our fundraising efforts, approximately three months ago, that Death/Control Denied founder, Chuck Schuldiner, was brought to Los Angeles to take part in a trial for a still experimental chemotherapy agent called Vincristine. Although the family was assured that the drug is virtually non-toxic in nature, the large dosage which Schuldiner received over the span of five days did indeed poison him causing risidual difficulties and weakness which he has been recovering from since. These effects are all considered to be temporary and in fact Chuck is making progress and gaining his strength back day by day. Previously unreleased Death demo material will be released by Hammerheart Records, worldwide, in an effort to raise additional funds. After costs, proceeds will be donated into Chuck's account. The release, although still not scheduled, will be called "Zero Tolerance". NB will be releasing another live CD called Live In Eindhoven (recorded at the Dynamo '98 show), which, by the way, was the first live appearance of the Sound Of Perseverance line-up. The CD will only be available through Nuclear Blast mail order. 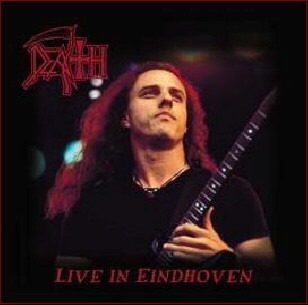 The CD will sell for $7, and $2.50 of each CD will go directly to the Chuck Schuldiner Medical Fund. There will also be a DVD for $12 of the same show. Both the CD and DVD will only be available in slip-sleeves (no jewel cases) and will be released on October 29. For more information on how to order the CD, please visit www.nuclearblast.de/death. There will also be an information card inside each copy of Live in L.A. (Death & Raw) with all the information on how to order. We added another tourschedule (ITP-Europe) on the TOURS page. We still need your help with this. Send us anything you have, including concert pics, posters, pics of t-shirts, short stories etc to tours@emptywords.org. Every now and then we update the BENEFIT page, keep an eye on it. If you know of any benefit event that's not posted, please get in touch with us and we'll post it. If you're not a team member yet of the Death/Control Denied team at United Devices, please check out the info on the UNITED DEVICES page and help us help them in the fight against cancer. Messages to Chuck can be sent to tanzid2@hotmail.com. You can also use the EMPTYWORDS guestbook to leave your message. In two weeks the Live in L.A. CD and DVD/VHS will hit stores in Europe. Save your money and buy it! We'll provide you with the reviews shortly. The info is already available on the WORKS page, including some snap shots of the DVD/VHS. Those planning to see Richard Christy with Iced Earth in Europe must have a bit of patience, as the tour has been rescheduled to January 2002. Iced Earth are going to be touring the States with Judas Priest and Anthrax first, check the Iced Earth site for dates. Chuck is home from the hospital for a week now and is showing much improvement. He appreciates very much the outpouring of email and it really lights up his day when he reads them. It really does make a big difference when I go over bringing so many messages of support. This is Chuck's mom. Due to a misunderstanding on my part, personal mail that should be going directly to Chuck is being sent to other addresses. When I was asked permission, I assumed it was email that I could print out and take to Chuck, as I always do. That is not the case. Chuck has been in the hospital here in Florida for 15 days undergoing treatment, and I see him every day and night. I have said before how much the support he gets from you all means to him, and this way I can take any mail, cards, etc over to him, something for him to look forward to daily. That makes a lot more sense than being sent to other addresses and then forwarded to him. My address is below for you to send personal correspondence directly to Chuck, in care of me. You can send email to tanzid2@hotmail.com Thank you. 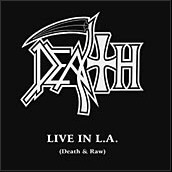 Death "Live in L.A." (Death & Raw) will be released in Europe on September 17th and in the USA on October 16th. VHS and DVD versions will be released on the same dates. "Live in L.A." was recorded at the legendary Whisky A Go Go in Los Angeles, California during the sold-out "The Sound Of Perseverance" tour. It never was planned to be released, so there are a few things on this album which are not 100% perfect, which you usually get from Chuck and his mates. This is a soundboard recording, which leads to some slight sound problems, but you can nonetheless hear the outstanding performance and musical quality of Death. This band is in a class all by itself! The sound is still absolutely outstanding and retains a gritty intensity that's missing on live records that are overdubbed. Over the past week we've experienced the "evil" of the net. Thanks to the Wscript virus we had some major problems. As of today we are going to host our newsletter at Bravenet, if you want to keep receiving the EmptyWords newsletter, please subscribe again. On behalf of Chuck's family, thank you for your continued support. Our efforts HAVE made a difference but we're far from finished with our work here. Follow-up scans show good progress with the new treatment and at this time our metal brother is receiving the best possible care. There are many more scans, medications and follow-up treatments needed so we'd like to stress that we need to continue this incredible solidarity and remain a trustworthy foundation for the family as things continue. To date some very generous donations have been made and although out of respect for people's privacy we will not list private individuals here, we'd like to acknowledge their personal sacrifices in our own way. In addition we thank Brian and Metal Blade for their support, Iann and MBS Productions, Jon Weiderhorn, all at Mazur PR, George Cox, ESQ, the kind folks at Delirium and everyone that has given up personal belongings or time to help us fight this battle. Naturally we want to send out our praise and support to Chuck Billy who has absolutely personified the true spirit of Heavy Metal by offering to share his benefit concert with The Schuldiner family. Please check out www.thrashofthetitans for more information on this historic metal event. Chuck, we thank you and you are not alone. Your personal letters have all been passed on, thanks for taking the time to do it. There were some incredible things said and everyone was truly touched. As everyone mobilizes their resources to help out, several benefit concerts have been put together. If you want to verify whether or not they are shows that we are aware of or endorse as ACTUAL benefits, feel free to email us. If you are DOING a show, please contact the label and share your info with us so we know who is doing what and where. We will also make sure everyone's donations end up where they should end up-with Chuck. We decided to remove the overseas page from the site.The worthwhile articles have been placed in the appropriate sections; TALKS/GIGS and VIEWS. We also posted the tourschedule for the TSOP European tour, (thanks Dave). Keep checking out the benefit page, as we update that regularly with new events. Both Hammerheart auctions at E-Bay and AllBeat are still going and this entire fundraiser is still very important. But they can only post new things as they receive them, so please keep them coming. Everybody who want to donate can email auction@hammerheartamerica.com or phone directly at (412) 390-4088. Some benefit dates have been rescheduled and some new benefit events have been added, check the BENEFIT page. For those who haven't noticed yet, we've added another Guitar World article (04-1995), thanks Brian. Check the TALKS. Whenever you have something laying around that you think would be nice to end up on EmptyWords let us know. The essay about metal in Iran is up as well, check the Voices From Iran article (TALKS as well). Chuck is home again after receiving the first of several treatments with a fairly new and still relatively experimental drug called Vincristine (VCR). Vincristine belongs to a class of naturally occurring chemotherapy agents, which are extracted from the periwinkle plant and, unlike many chemotherapy drugs, bears practically no toxic side effects. Chuck was initially turned away at the door when the administrator of Cedar Sinai Comprehensive Care Center informed Chuck and his sister that he would not be brought in until they produced enough money, up front. Many more treatments will be necessary to restore Chuck's health and will most likely be in conjunction with other types of cancer treatments, which possibly include another surgery. For more information on how YOU can help make a difference in someone's fight for life, check the details on the SUPPORT page and act today! He is one of our own and we will NOT leave him behind. First of all we want to thank Chuck Billy on behalf of all Death/Control Denied fans for his more than generous offer to share a part of the Thrash Of The Titans festival proceeds with Chuck. The BENEFIT page is back again, all benefit concerts and events will be placed there. Let us know when you want your benefit event/concert on as well. There is going to be a benefit festival in the Netherlands on September the 2nd in 013/Tilburg, check out the Dutch Tribute Site. Chuck's mom asked us to post this message from her to all the readers of this site. "This has been one of the worst days since we found out about Chuck's illness. He went to Cedars Sinai hospital in Los Angeles, California today for his appointment for the first treatment. Beth, his sister, went with her father's credit cards, Power of Attorney, and a Letter of Intent from Music Care to help with the large expenses of this treatment. Beth was told by the Vice President of Cedars Sinai's comprehensive Care Center, Floyd Frasier, #310-425-0600, that none of these were acceptable to them. The Executive Director, Paul Odea, would not even talk to her. Beth was frantic, asking if Chuck's treatment could be started until she could get the matter resolved. No was the answer. After finally threatening to get her attorney involved and to go to the media, as she had to do when the surgery took place last year in New York, they finally took the cards, allowing the procedure to take place. I am telling you this so all of you will know of the continuing saga of how the American health system is willing to let a person die for the sake of money. My son has never expected charity. For two years he and Beth have paid over $200,000.00 of their own money, plus the generous donations of his fans and friends, for the treatments for his illness, aware every time that if he does not get the money, he will die. Even when the cash is paid, the attitude of the caregivers and hospitals are one bordering on contempt that he does not have insurance. There is something terribly wrong when a country as great as America will let their citizens die for lack of insurance or money. Unfortunately, we had to have a devastating illness to realize that we are unprotected in many ways. I am asking the people who read this to please get insurance, immediately. This could happen to you if you live in the United States of America. Chuck's illness was caused by a split cell, it is a fluke, not genetic or anything he ate or drank or the air he breathed. That also could happen to any of us. So please, as healthy as you are today, you may, God forbid, desperately need that insurance tomorrow. I want to thank you all for your emails, letters, cards and support you have given Chuck. As in last year, it means so much, not only to Chuck, but to us, his family." Maria Abril will be flying from Pittsburgh to Florida to visit Chuck Schuldiner tomorrow, May 26th. She has requested that anyone that would like to send Chuck get-well wishes may do so by e-mailing her directly at letters@hammerheartamerica.com . We MUST receive all letters at our office by 1 A.M U.S. Eastern time in order for her to be able to deliver them to Chuck in person. We kindly ask, however, that all letters refrain from mentioning the media scrutiny and the benefit auctions at this time. It is our desire to help raise Chuck's spirits at a crucial time in his treatment/recovery process, and as such we'd like to show him how much his MUSIC and his creative energy has touched us all over the past decade and a half, as opposed to this dreadful disease. It would help tremendously for him to know how many people truly care and love him and have been positively affected by his art. Aside from family and friends, his music and his fans truly are THE most important thing in his life. Today we have to put out a very sad message. Chuck is very seriously ill again, the tumor has recurred and another operation is probably going to happen this week. Please take note of the support page again, it's still needed very badly. Two years ago this month, on his 31st birthday, Chuck Schuldiner, founder of Death & Control Denied and forefather to an entire movement in Heavy Metal, was diagnosed with a malignant brain tumor. For the past two years, Chuck has fought for his life, family and passion for music. Fans worldwide voiced their concern and support and when possible tried to send donations to the Schuldiner's medical fund to assist in the payment of Chuck's care. Hammerheart and the entire Schuldiner family are greatly appreciative for the continued generosity and enthusiasm, however at this time have additional news to share with the musical community. At this very moment it is necessary for Chuck to have a very specific and immediate surgical treatment which is being denied to him based on a lack of funds. Chuck needs immediate surgery; in fact he is at home in Florida awaiting the opportunity for a very delicate operation that his doctors adamantly insist is crucial for his recovery. After having exhausted every possible avenue, Chuck's family and friends are reaching out to ask for your assistance. Added two old interviews from Guitar World (1992) (thanks again Rob), check the TALKS. Also added the first two tourschedules that were sent to us, check the new TOURS page, and keep them coming! From Nuclear Blast the long awaited tracklist for Death Live in L.A.
Intro~The Philosopher~Spirit Crusher~Trapped In A Corner~Scavenger Of Human Sorrow~Crystal Mountain~Flesh And The Power It Holds~Zero Tolerance~Zombie Ritual~Suicide Machine~Together As One~Empty Words~Symbolic~Pull The Plug. We want to gather all the past tourschedules for the SCHEDULE page. We need your help. Send us any information you have (ie:dates from the back of tour shirts). Today we present the new URL for the EmptyWords site: www.emptywords.org . Due to the high amount of traffic we had to obtain more webspace, thanks for visiting our site, we're really honored to be having so many visitors! The old url will be working as usual. "Live In L.A. (Death & Raw)" will be released soon, the first live album of Death. Recorded during their US tour 1999, all classics of the long Death-history will be featured there! This show will be available on CD, video and DVD. We put some tips on the United Devices page. Another old concert review from Metal Maniacs is published (thanks Robbie), check the GIGS. On the DEATH / CONTROL DENIED FANS UNITED page you can find out about how to join the team we've set up at United Devices. It shows how you can help the University of Oxford in finding a drug against cancer. Please step in to join us and make a difference ! At the moment we are working on a story called "Voices From Iran". The first part is published in TALKS. At this time, schedules are finally coming together for these busy guys. The remaining guitar tracks are going to be recorded next month. Exact scheduling for Steve's sessions is still being worked out so we'll keep everyone posted. Due to the enormous amount of work creating this album and supporting it from within the label, When Machine and Man Collide will not be a summer release. We do promise that it will be 250% worth the wait!!! Artwork is being done by Travis Smith who co-designed Control Denied's debut CD, The Fragile Art of Existence. We added another old concert review (October 3th 1993) check out the GIGS. We also want to give one of the bands that played on the benefit festival last year some attention; God Dethroned, check out the TALKS. Added an old concert review (October 25th 1998) check out the GIGS. Published the last missing Rock Hard review, Individual Thought Patterns, check out the VIEWS. Another oldie from the Rock Hard review archives is on, Leprosy, check out the VIEWS. Published the next missing Rock Hard review, Spiritual Healing, check out the VIEWS. The German Rock Hard is working on their archives, which gives us a chance to complete our own collection of Rock Hard reviews. The review of Scream Bloody Gore is published, check out the VIEWS. While awaiting the new Control Denied album "When Machine And Man Collide", we thought it would be interesting for you to find out more about one of Richard Christy's other bands Burning Inside. After we finally heard their album "The Eve Of The Entities" we decided to put on an interview with Steve Childers. Check out the TALKS page. Happy new year to all of you. We rearranged the news pages and are ready for the news of 2001, you can always use the sitemap if things are not clear.